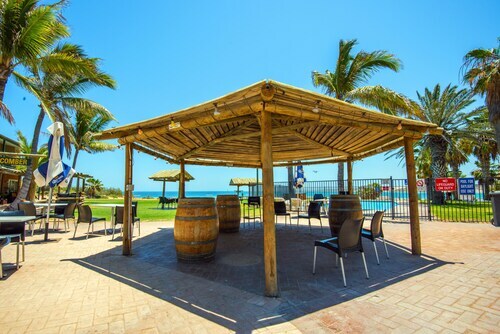 Nestled on the beach, this Coral Bay hotel is 0.1 mi (0.1 km) from Coral Bay Beach and 2.5 mi (4.1 km) from Ningaloo Reef. The southern gateway to the spectacular Ningaloo Reef, Coral Bay is a small settlement with only a few houses, restaurants and stores. A stay in one of Coral Bay's hotels will give you the luxury of having the reef at your doorstep. There isn't a better location to begin exploring this wonderful reef from. Come and see for yourself today! The ocean is definitely Coral Bay's greatest attraction, with tourists coming from all over the world to explore Ningaloo Reef. One of the few fringing reefs in the world, you can swim from the shore to tropical coral gardens in less than 100 metres. The protected lagoon the reef forms around Coral Bay is ideal for young kids to swim and play in, or inexperienced snorkelers and swimmers. If you want to see the reef without getting wet, a cruise on a semi-submersible will bring you right close to the underwater wonders without putting a toe in the water. The fishing in Coral Bay is superb, so throw a line in off the beach or the bay and see if you can bring home supper. Coral Bay is warm most of the year round, and you are always guaranteed to see a ton of tropical fish, turtles and maybe even a manta ray. From March to June keep an eye out for whale sharks as they cruise past Coral Bay on their migratory path. Whale sharks are the world's largest fish and can grow up to 18m long – take a swim with them and you're sure to have a once-in-a-lifetime experience! Don't worry though, despite the name "shark" they actually are more like a whale, eating only plankton. For an interesting experience, time your holiday with the first full moon after Easter. You'll be able to witness the coral spawn, an underwater snowstorm that always occurs at night. The spawn is the start of a mammoth feeding cycle, and always brings the whale sharks in closer to shore. During November and February you can catch turtles nesting on the local beaches, an awesome sight as they retreat in their hundreds to the water's edge. Coral Bay sits 140 kilometres from Exmouth, and 1,200 kilometres north of Perth. You can fly into the airport at Exmouth, or spend a lovely two days driving up the coast from Perth. What else could you need except your snorkel? Book a trip to paradise today with our range of Coral Bay accommodation. How Much is a Hotel Room in Coral Bay? Hotels in Coral Bay start at AU$239 per night. Prices and availability subject to change. Additional terms may apply. Spectacular position so close to the beach and all facilities. Staff very helpful except for one difficult bar person. Fridge in room noisy when trying to sleep but otherwise all good and laundry facilities fine. Food good and ice cream milkshakes by Rhonda out of this world. Beach and Indian Ocean idyllic.